Do you ever think about the human species, where we came from and where we’re going? I do. I’m very excited about seeing a new movie, The Cave of Forgotten Dreams, that will probably be the closest look any of us will ever get of the oldest art created by our species. By all accounts the art is pretty wonderful. The film is by Werner Herzog, who has made so many memorable films, like Fitzcarraldo, Encounters at the End of the World, Grizzly Man, and many more dramas and documentaries. The Cave of Forgotten Dreams is about Chauvet Cave in France, which contains the oldest art known to be in existence. The film is also Herzog’s only (and probably last) film to be made in 3D. Here’s some background information about prehistoric cave art, which I have long loved for its mystery and beauty. For perspective, science tells us that humans have been around for 190,000 years but only began writing around 5,000 years ago. All that time before writing is considered prehistoric. Not much is known about most of our species’ history. The first major cave with paintings discovered by modern humans was Altamira. In 1879, the nine-year-old daughter of a nobleman who was also an amateur archeologist led her father into this northern Spanish cave to see the paintings on its walls. The cave had been sealed by a rockfall 13,000 years ago, and only when a fallen tree disturbed the rocks was human entry again possible. The next year, he and other Spanish archeologists proclaimed the paintings to be Paleolithic in origin. They were ridiculed. We may laugh about this now, but for years, the cave paintings were thought by many eminent scientists to be forgeries, because prehistoric humans were considered incapable of creating such art! Anyway, in 1902, the leading proponent of the forgery idea famously admitted he had made a mistake in print (‘mea culpa”). Horses, bison, goats, deer, wild boars, negative handprints made by blowing paint around the hand, and abstract shapes appear in Altamira. Other Spanish caves with prehistoric art were soon discovered, but none matched Altamira. The Altamira paintings are estimated to be 17,000 years old. The second major discovery of prehistoric cave paintings was at Lascaux in southern France. Four teenage boys discovered the cave in 1940 when a dog disappeared into it. They followed the dog, saw the art, and told their teacher, who told an expert. The oldest Lascaux paintings as old as 20,000 years. There are over 2,000 figures of animals, humans, and abstractions: horses, stags, cattle, bison, felines, bird, bear, rhinoceros, aurochs (huge bulls) appear, as do some abstractions that may be maps of constellations. The cave of the new Herzog film is Chauvet Cave in southern France. It was discovered in 1994 by three archeologists who felt an updraft of cool air while exploring a cliff. Chauvet has never been open to the public. Only a handful of researchers and scientists have been inside. Herzog is the only filmmaker granted access, and he was limited in how many people and what kind of equipment he could bring in. He winged it pretty well, I hope. 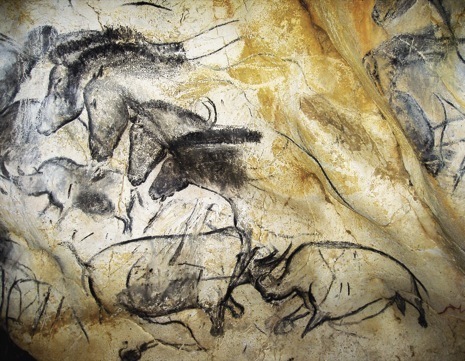 The oldest Chauvet paintings were painted 37,000 years ago. These paintings made when both Homo sapiens and Neanderthals coexisted in Europe, one species on its way in, the other on its way out. The artists used perspective, shading, stencils, pointillism. They worked with the caves’ contours to produce 3D effects. They blew paint through hollow tubes to create a certain effect. They used charcoal and colored clays from the earth to draw and paint with, made lamps of animal fat and plant wick to see what they were doing, created brushes, even built scaffolding. The art looks fresh and spontaneous, as if painted with a skilled, practiced hand. There is evidence in places of pigment being scraped away and painted over. These guys and gals (some of the hands depicted on the walls are female) were serious artists. From here, one emerges into the deepest recess of Chauvet, the End Chamber, a spectacular vaulted space that contains more than a third of the cave’s etchings and paintings—a few in ochre, most in charcoal, and all meticulously composed. A great frieze covers the back left wall: a pride of lions with Pointillist whiskers seems to be hunting a herd of bison, which appear to have stampeded a troop of rhinos, one of which looks as if it had fallen into, or is climbing out of, a cavity in the rock. Now maybe you’re getting a sense of why this movie is so meaningful. It opens up so many questions: Was this art created for ritual purposes? Was it for good luck in hunting or to celebrate a successful hunt? Was it for fun, because they could? Why are humans and plants and landscapes not depicted? Were these paintings made by shamans, teenagers, men, women? How did they get so good? How is it that perspective wasn’t rediscovered for thousands of years? Imagine the later painters encountering the earlier paintings. Some paintings were painted over a period of thousands of years. Imagine collaborating with your distant ancestors. Mammoths, lions, bison, and rhinoceroses all existed in southern France during this time! Getting to see these images is a rare opportunity to see our species freshly and to have a little more information into the big mystery of life, at the same time as these images deepen the mystery about who we are and where we’re coming from. The carbon dioxide in human breath damages cave paintings. Fungus and mold grow and spread. All these caves are now closed to the public, with research carefully monitored, but replicas have been made of Altamira and Lascaux, and one is planned for Chauvet. So we probably won’t get to see the real thing. This is as close as it gets. This entry was posted in connecting, images, inspiration, movies, photos, science, story by MaryAnn Reynolds. Bookmark the permalink.